Today’s National Nutrition Month tip of the day is to embrace apps – appetizers, that is. Sounds counterintuitive, but studies show that people who eat a low-calorie appetizer before a meal will eat fewer total calories during that meal (I love this fact sheet from the CDC). 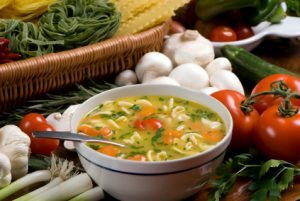 Good choices include broth-based soups (I love miso soup, but more traditional soups such as chicken noodle or minestrone are also great) or garden salads. Just skip the heavy dressings, croutons, bacon bits or tortilla strips and stick to raw veggies…maybe add a little fruit, nuts or seeds for added flavor and good fats. Speaking of good fats and salads, some of the vitamins in vegetables are fat-soluble, meaning they get absorbed better when eaten with a little bit of fat. So don’t feel guilty if you toss a few pecans, almond slivers, avocadoes or olives onto your greens. You’re actually making it more healthy! Later this month I’ll share quick and easy tips my family and I use to make sure each dinner starts with a healthy salad. Stay tuned! Good point about the fat in the salad, Elana. A D E K wont be absorbed without it; all those who use nonfat dressings may be shortchanging themselves. How do you feel about readily prepared salad stuff, have they lost much of their vit content? Good question, Warren – I really don’t know if ready-made salad stuff has any fewer vitamins than whole/uncut veggies. I’d imagine that it’s hard to compare – produce picked before its prime tends to have less vitamins and nutrients than when it’s at its peak. I do know that for many busy people, having ready-made salad stuff is a necessary tool to get a salad on the table. So if the alternative is no salad at all, I say whatever works!